Spring Training is right around the corner, and a new ballpark is about to be seen by many for the first time. After spending 13 years in Tucson, the Arizona Diamondbacks, as well as the Colorado Rockies, have moved to the new Salt River Fields at Talking Stick in Scottsdale, AZ. This 140-acre site is the first Major League Spring Training facility built on Indian land, and offers many amenities that will surely make it a fan favorite. From the large parking lot, there will be scenic trails and two bridges that lead to the practice fields, batting cages, and the stadium; where fans can walk alongside players, take pictures, and maybe get an autograph or two. Fan comfort was considered when the stadium was designed, and about 80 percent of the 7,000 seats will be shaded from the hot sun. In addition, there will be two outfield lawn areas, as well as three party decks accessible to fans. Spectators will also enjoy viewing the largest video screen of any spring training ballpark. There will be a good selection of foods to choose from, including familiar names such as Native New Yorker, Salty Senorita’s and Cold Stone Creamery. Every concession stand will also have a nice view of the field so no action will be missed. Within the complex, there is also a three acre lake, and unmatched panoramic views of surrounding mountains, including Camelback and the Superstitions. Include reasonably priced tickets, and the new stadium located west of the 101 and north of Indian Bend Road should be a big success. 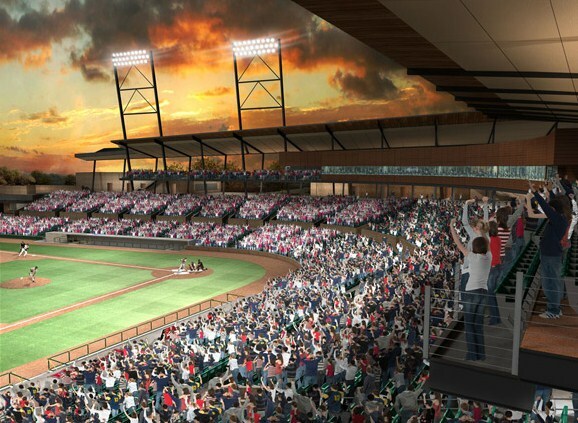 With the first game scheduled for February 26th, Salt River Fields at Talking Stick is primed to offer the ultimate baseball fan experience as the newest, and one of the finest parks in the Cactus League. ~ by Troy Erickson Realtor on January 27, 2011.